Web:	www.jeffboylegroup.com If your property is listed with a real estate broker, please disregard. It is not our intention to solicit the offerings of other real estate brokers. We are happy to work with them and cooperate fully. The Jeff Boyle Group at Keller Willimas fully supports the principles of the Fair Housing Act and the Equal Opportunity Act. Each office individually owned and operated. 1383 New London Road, Hamilton, Ohio 45013 Jeffrey R. Boyle Mobile:	513.295.5750 Office: 513.275.9867 Email:	jeff@jeffboylegroup.com Web:	www.jeffboylegroup.com If your property is listed with a real estate broker, please disregard. It is not our intention to solicit the offerings of other real estate brokers. We are happy to work with them and cooperate fully. The Jeff Boyle Group at Keller Willimas fully supports the principles of the Fair Housing Act and the Equal Opportunity Act. Each office individually owned and operated. When you retain the Jeff Boyle Group at Keller Williams to help you buy or sell your home, you get a full service, full time, award winning team of professionals. We pride ourselves on excellent service to our clients. We know that your real estate transaction involves not only your most important investment, but also the place you call home. Take a look at the names and faces that will help make your real estate dreams a reality. If your property is listed with a real estate broker, please disregard. It is not our intention to solicit the offerings of other real estate brokers. We are happy to work with them and cooperate fully. The Jeff Boyle Group at Keller Williams fully supports the principles of the Fair Housing Act and the Equal Opportunity Act. Each office individually owned and operated. 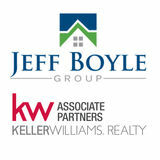 “The Jeff Boyle Group is everything you would want in a Real Estate Team. They’re very knowledgeable, organized and treat you more like a friend, rather than just another client. 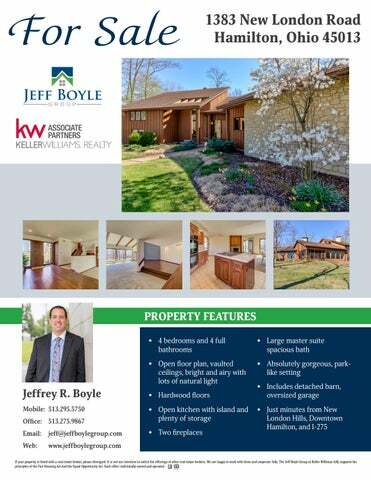 Our buying and selling process went so smoothly and we couldn’t be happier!” - Zillow Review When you retain the Jeff Boyle Group at Keller Williams to help you buy or sell your home, you get a full service, full time, award winning team of professionals. We pride ourselves on excellent service to our clients. We know that your real estate transaction involves not only your most important investment, but also the place you call home. Take a look at what we offer: • Award winning, full-service, full-time real estate team with a strong presence in our local community. Working with a team provides you with better service, consistent communication and the expertise you deserve. •	Client-centric service that’s focused on buying and selling homes. Sell for more money and buy for less. •	Knowledgeable resource for all your real estate needs including guidance throughout the entire transaction. •	Services that go beyond most other agents like professional photography, marketing and graphic design services, technology, and administrative support. •	Successfully closed over 300 real estate transactions, including over 70 last year alone. •	Professional services to assist in your transaction such as stagers, contractors, etc. •	Advise you through the legal pitfalls of your real estate transaction •	Knowledgeable on new construction and building. CONTACT US TODAY! Office: 513.275.1120 Buyer/Seller Line: 513.275.9867 info@jeffboylegroup.com www.jeffboylegroup.com www.facebook.com/JBGhomes www.twitter.com/jeffboylegroup If your property is listed with a real estate broker, please disregard. It is not our intention to solicit the offerings of other real estate brokers. We are happy to work with them and cooperate fully. The Jeff Boyle Group at Keller Willimas fully supports the principles of the Fair Housing Act and the Equal Opportunity Act. Each office individually owned and operated. Home For Sale in Hamilton, OH!